If you look back at the anecdotes of World War 2 food, people have mixed feelings about Spam. However, I would imagine that when it arrived in 1941 it was quite warmly greeted by a population short on meat and lacking variety in their diet. Without a fridge, an opened tin of Spam would have to have been used up quickly, but it could be sliced, battered and fried for breakfast, used as a sandwich filling or cold meat, added to salads and cooked into evening meals, so it was pretty versatile. Still, you don’t find many Spam recipes from the period in books. Perhaps I will come across more as my research progresses, but what I decided to do with the first tin of Spam I have ever bought (I don’t remember whether I had it as a kid) was to use it in place of corned beef in a hash recipe. Melt the dripping in a frying pan and gently fry the onions until they’re soft. Add the corned beef and potatoes, and cook for several minutes. Add the tomatoes, and season to taste. Cover and cook very slowly for 15 minutes. We may well try this in due course, or the recipe underneath it in the book – Curried Corned Beef Balls – but this post is about Spam. Throw a slug of olive oil into a frying pan with the mixed herbs and gently fry the onions and garlic until they’re soft. 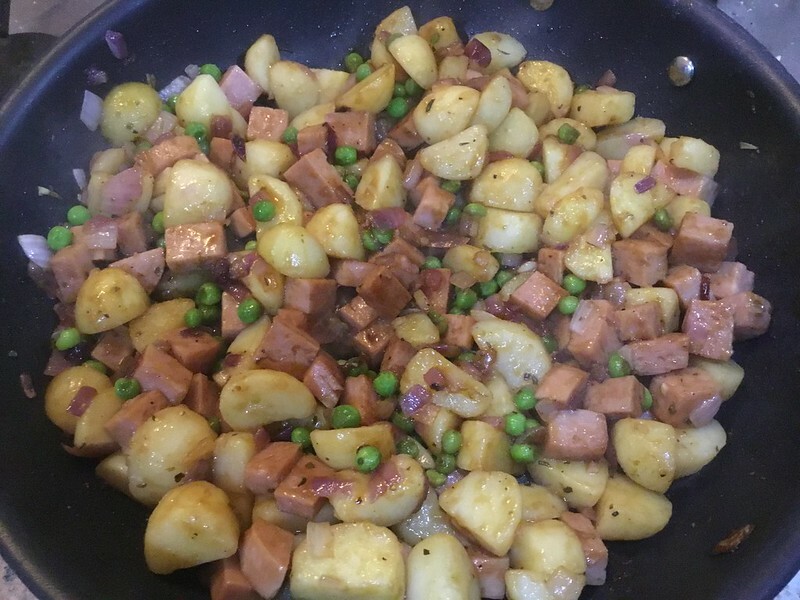 Add the diced Spam and potatoes, and cook for several minutes. Add the frozen peas, and season to taste. Keep frying until everything is hot, and the potatoes have gone as brown and crispy as you like them. We weren’t holding out high hopes for the Spam, but actually – it’s quite nice. This was certainly an acceptable meal, which we would be happy to have again. If you wanted to be fancy, you could throw in a couple of beaten eggs and turn it into a breakfast brunch kind of deal. I also thought it would be nice smothered in parsley sauce, and adding in a bit of sauce (or tinned tomatoes) would turn it into a good pie filling. Sainsbury’s do a foil packet ‘Long life potato and bacon brunch’, which isn’t a million miles away from this, but has a lot less bacon in it. Their version isn’t bad if you’re prepping for TEOTWAWKI (the end of the world as we know it), but making your own is nicer. We still have half a tin of diced Spam in the fridge. We’re going to add it to Pad Thai this evening. Wish us luck!